New Delhi, February 14: BJP veterans, including L.K. 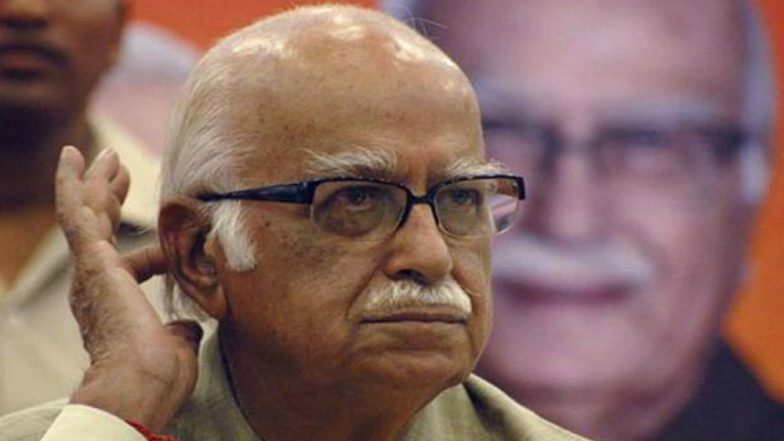 Advani and Murli Manohar Joshi, are likely to contest the 2019 Lok Sabha polls, notwithstanding an informal bar on those above 75 years occupying ministerial and organisational posts. A final decision in this regard would be taken by the party's Central Election Committee when it meets after the announcement of the election schedule, likely in the first week of March. Sources in BJP said the party leadership had given an informal green signal to these veterans. They said the leadership wanted to persuade Advani (91) to vacate the Gandhinagar Lok Sabha seat for her daughter Pratibha but he is said to have turned down the proposal. Advani's stance was that having fought against dynasty politics throughout his career, he cannot compromise on it. Instead, he is keen on contesting the coming polls. Advani, currently the oldest member of the Lok Sabha, has represented the Gandhinagar constituency since 1991 and has been winning all the last five general elections by a big margin. In the 2017 Assembly polls, the BJP faced a tough fight from the Congress and its tally was restricted to 99 of the 182 Assembly seats. The party failed to open its account in districts like Morbi, Amreli and Gir Somnath while in Gandhinagar the BJP won five of the seven Assembly seats. If Advani contests, he would become the oldest MP ever to fight the Lok Sabha elections after Ram Sunder Das of the Janata Dal-United, who won from Hajipur in 2009 at age 88 and vacated office at the age of 93. Besides Advani, party veterans Murli Manohar Joshi (84), Shanta Kumar (85), Kalraj Mishra (77) and Bhagat Singh Koshyari (77) are also likely to be fielded in the Lok Sabha polls, the sources said. Joshi, who won in 2014 from Kanpur, was the BJP President between 1991 and 1993 and has also represented Allahabad and Varanasi in Parliament. In 2014, he was shifted to Kanpur after the party decided to field Narendra Modi in Varanasi. Advani and Joshi, considered three top leaders of BJP after former Prime Minister Atal Bihari Vajpayee, did not find a place in BJP's highest decision-making body, the Parliamentary Board when the BJP President took charge. Instead he created a Marg Darshak Mandal that comprises Prime Minister Modi, Home Minister Rajnath Singh, Shah himself as well as Joshi and Advani. Shanta Kumar has been representing Kangra constituency in Himachal Pradesh. The former Chief Minister of the hill state was first elected from there in 1989. He was re-elected to the Lok Sabha in 1998, 1999 and 2014 from Kangra. Mishra, the BJP's prominent Brahmin face in Uttar Pradesh, is representing Deoria in the current Lok Sabha. He was inducted into Modi's Council of Ministers as MoS independent charge of Micro, Small and Medium Enterprises but dropped later on age grounds. Koshyari, a former Chief Minister of Uttarakhand, represents Nainital-Udhamsingh Nagar constituency. He also served as a Rajya Sabha MP. Sources in BJP said the party leadership had given the green signal to these leaders after taking their consent. The change in BJP's position on veteran leaders is being seen as a move giving weightage to winnability of candidates than their age. This also comes in the wake of opposition parties joining hands ahead of the Lok Sabha polls. The sources said the move was well calculated as the BJP does not want to trigger any controversy by denying the veterans a ticket. "The age bar set by the party leadership is not official or written in its constitution. It is just an arrangement. As far as my knowledge goes, the age bar is not for contesting elections but for holding party and government posts," a top BJP functionary told IANS on the condition of anonymity.